Brian Copenhaver’s Magic In Western Culture traces occult beliefs From Antiquity to the Enlightenment. His study starts in Ancient Iran, Greece, and Rome, and moves through the early Christian Church to the influential thinkers of the Renaissance. Magic is treated as a tradition that derives from classical philosophy, as Copenhaver examines why European intellectuals “repudiate magic in the Enlightenment, after having previously accepted it for more than two millennia” (xiii). Copenhaver suggests that before the Enlightenment most educated Western people believed in magic – a tradition handed down from Herodotus. But the early Catholic Church claimed any supernatural activity in The Bible was the result of divine miracles (not earthly magic), which created little problem until Thomas Aquinas insisted that if there were heavenly angels there must also be hell’s counterparts – demons. Thereafter, devils were seen as tempting the faithful with magic powers and turning them into witches. This belief persisted into the Middle Ages and beyond. As further medical advances were made, traditional magic was superseded by new therapies – regimen, pharmacy, and surgery. Doctors of Physic practiced a natural philosophy whereby physical treatment (not ritual or religious) aimed to produce the correct mix of humors in the body. During the Renaissance, natural philosophy gradually gave way to mechanical science, particularly after the invention of the telescope and microscope. Men like Descartes favored reason, method, and metaphysics over occultism, but this was not a clear-cut process. Isaac Newton, for example, spent much of his scientific career as an alchemist searching for the Philosopher’s Stone, and was later called “the last of the magicians” (288). 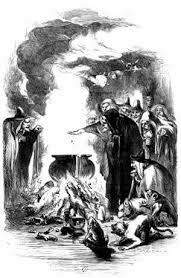 But over the centuries, magic gradually succumbed to the dual pressures of religion and science until it fell out of fashion with the European intellectuals. Magic In Western Culture is a dense, scholarly book, lightened in part by the rich illustrations. Copenhaver has sifted through the murky realms of early belief to piece together a well-researched, cohesive analysis of the occult tradition. His section on Newton is particularly fascinating. I also enjoyed the references to Shakespeare’s plays that highlight the intersection between intellectual development and common folklore. If you have an academic or historic interest in the rise and decline of magic you will find this book an impressive read. Highly recommended! For thousands of years people believed in magic. They were simple folk – often afraid and confused – unable to grasp the scientific world around them. * and find solace in a harsh, unfair world. According to Sigmund Freud, each civilization passes through three distinct stages of development. In the Magical Phase the primitive does not understand a natural phenomenon like rainfall, but he knows he needs water to survive. By creating a ritual – rain dancing for example – he believes he can influence the weather to obey his wishes. As society progresses the community enters the Religious Phase. The rain-seeking ritual develops into an intricate rite of prayer, song, dance, and sacrifice, whereby the worshippers barter with the gods for their precious water. Was Freud correct though? Even in today’s super-scientific space age a huge portion of the globe still follows the religious beliefs of their ancestors, and paganism is on the rise. It turns out science does not have all the answers. It might satisfy the mind but it cannot soothe the wounded soul! Freud, Sigmund. The Future of an Illusion. New York: Norton, 1989.